I hope everyone enjoyed a great swim season but unfortunately this swim season is coming to an end. 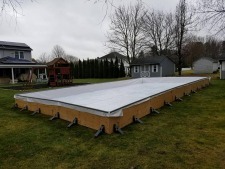 Winter will soon be upon us and Juliano’s Pools has the perfect product for the outdoor enthusiasts your very own backyard ice skating rink. If you are a family that values the outdoors and healthy exercise, then you may be an ideal candidate to install your own backyard ice rink at your home. A backyard ice skating rink from Juliano’s will instantly provide your family and friends a vast amount of benefits. As in the movie Field of Dreams “If you build it they will come” your backyard skating rink will now become a gathering area for everyone to have many hours of recreation and fun. A new backyard ice rink is a great way to spend time together with family and friends and will soon become a yearly tradition. A nice rink backyard ice skating rink is a great way for skaters of all ages and ability to spend time together outside in the fresh air right in your own backyard. Hours and hours of fun with friends and family! 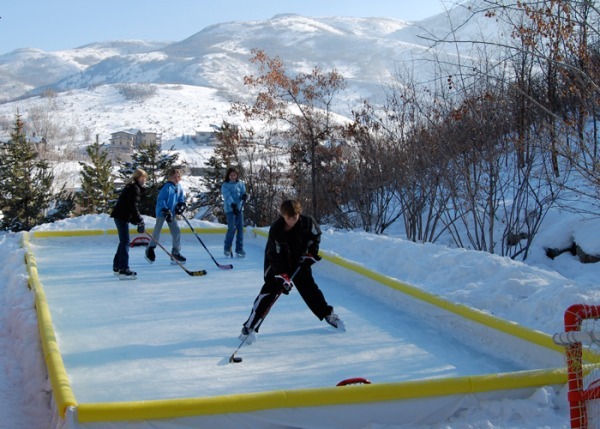 Typically when the temperature drops so does your activity level a backyard rink is a great way to stay active. Put away the kid’s electronic devices and have the kid’s friends over to your backyard skating rink. This is a great way to keep your kids healthy and active. Picture yourself lacing up your skates in the comfort of your own home, skating at night while snow falls from the sky and afterwards sitting by a fire sipping on a cup of hot chocolate. A Nice Rink backyard rink is great if you have a child that plays ice hockey they can practice there skating, stick handling, shooting and passing in the comfort of their own backyard. As you now not many people make it to the NHL but why not let the kids try to make their dream come true by honing their skills on their own backyard skating rink. Figure skaters can also practice all of their moves and routine. Experience the beauty of your own smooth shiny ice and the crisp sounds of skates cutting through the ice. A backyard rink gives you the convenience of unlimited ice and no car rides to the local skating rinks. A backyard skating rink will provide a lifetime of memories create your own frozen memories with a backyard skating rink from Juliano’s. Another completed backyard ice rink by Juliano’s Pools!